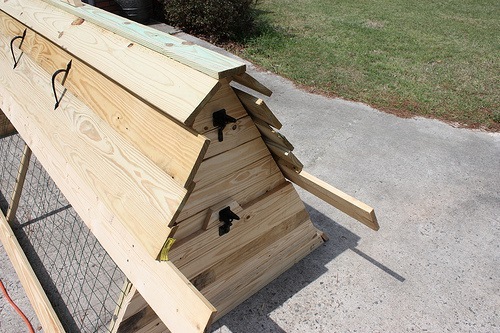 A few months back, I spent a few days and a few dollars (that’s putting it lightly) building a chicken coop with the hopes of getting some fresh eggs. 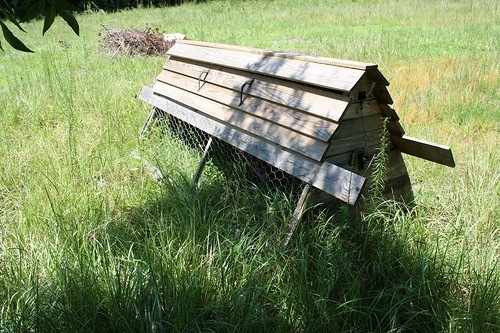 I used the plans from http://www.catawbacoops.com/ It seems rational to me…a portable chicken coop. The design is horrible. My chickens were “stolen” within the first month of putting them in the coop. I woke up one morning and the side of the coop was on the ground. No chickens were in sight. I did find some chicken feathers about 25 feet away. Not only that, but this thing is far from being “portable”. It takes two grown men to even move it a few feet. Imagine trying to move it with the chickens inside. You can’t lift it too high or they’ll escape. Since I’m only one grown man, I can’t move it. My brother-in-law did me a favor when he was in town and moved it for me. He thought that you were supposed to drag it, so he did, and the bottom fell apart. When that happened, the door fell off. If I want to raise chickens again, I’ll need to fix it. It’s still standing, but it’s only been five months. I hope the handles still hold up. I don’t want to sound like I’m complaining, because I’m not. I was just super excited about raising my own chickens! I think I’ll wait until Spring and try again. I might even consider a different design that incorporates wheels. Aaagh! I’m going crazy with anticipation!